This is a 100% natural product containing over 396 active ingredients. Deer Velvet is a rich source of all the nutrients our bodies need including the minerals calcium, phosphorus, sulphur, magnesium, potassium, sodium, manganese, zinc, copper, iron, selenium and cobalt. Also found in Deer Velvet Antler in varying quantities are the major amino acids, collagen, anti inflammatory prostaglandins, glucosamine, chondroitin, gangliosides, and erythropoietin and the essential fatty acids Omega 3 and 6. Deer Velvet has remarkable health promoting and rejuvenating properties, and has been prized in the Orient for over 2000 years. Today, Western research into Deer Velvet is proving the validity of traditional claims. To date, research results are showing that this ancient remedy may be one of nature's safest multipurpose sources of energy. Because Deer Velvet is the only living mammalian tissue that grows and is shed each year, it is believed to be a treasure trove of biologically active substances. Maintaining the body's general well being. 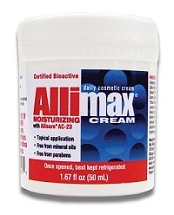 Assistance with good joint care, bone density, and improved mobility. Boosting the body's natural immune system in order to support against colds and flu. Improvement in the body's strength, stamina and athletic performance. Omega 3 and Omega 6, and IGF-1, and IGF-2. Deer Antler Velvet has been consumed for at least 2000 years. The first documented use of Deer Velvet has been traced back to the Han tomb in the Hunan Province in China where a silk scroll was discovered listing over 50 conditions for which Deer Velvet is given. Consistent with the holistic approach of Traditional Chinese Medicine, Deer Velvet is taken as a general tonic to restore balance, strengthen the body and promote overall wellness. One of the few "pure" tonics among the thousands of natural remedies in the Chinese pharmacopoeia, Deer Velvet is in the same highly regarded category as ginseng. Individual results will vary dependent upon many factors, and for the type of health benefit being sought. Many individuals report experiencing benefit by their second to third week of use. Directions: For convenience, Mountain Red® Deer Velvet is available as a once a day capsule. 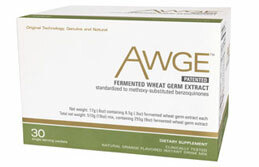 Normal dosage for general well being is (1) 500mg capsule per day. For Athletes and enhanced performance - up to 6 capsules daily. 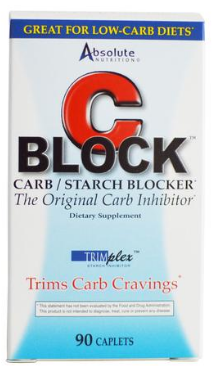 Ingredients: Each Bottle contains 60 capsules with 500mg. 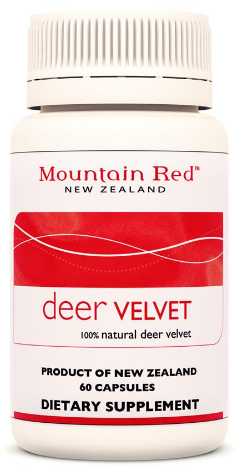 of the highest quality 100% pure premium New Zealand Red Deer Velvet. It is free from preservatives, additives or fillers.